The Adaptec RAID 5805 Unified Serial RAID controller offers a new level of flexibility and performance to servers and workstations by supporting either 3.0 Gb/s SAS hard drives for performance or lower cost SATA hard drives for capacity. Supporting RAID 0, 1, 1E, 5, 5EE, 6, 10, 50 and 60, it can not only backup data but can also extend the storage capacity of a system significantly. It supports the industry’s fastest bus speeds at PCI-Express X8 and offers complete connectivity with 2 internal mini-SAS connectors. Using SAS expanders, it can connect up to 256 SAS devices. 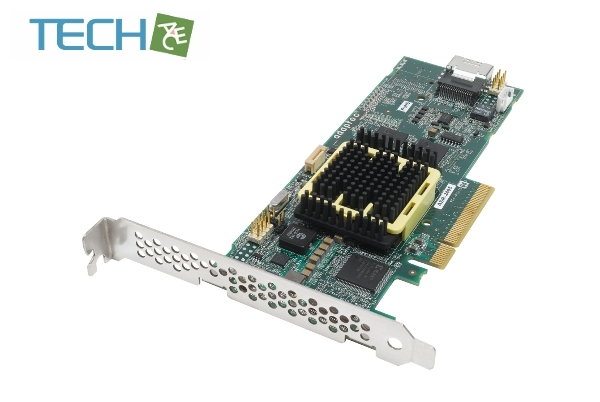 Using an industry-leading dual core RAID on Chip (ROC) processor and 512MB of DDR2 write cache, this high-performance PCIe-to-SAS RAID host adapter delivers enterprise-class performance for mission critical server applications. Serial Attached SCSI Interface With two internal mini-SAS (Serial Attached SCSI) ports, the Adaptec RAID 5805 supports both 3.0 Gb/s SAS and SATA II devices for enhanced flexibility and speed. RAID Support The Adaptec RAID 5805 supports multi-level RAID configuration including RAID 0, 1, 1E, 5, 5EE, 6, 10, 50 and 60 for better performance, enhanced data security and flexible capacity upgrades. On-board I/O Processor The Adaptec RAID 5805 features a powerful 1.2GHz dual-core processor for fast hardware RAID parity calculations. 512MB Cache Memory 512MB of DDR2 533MHz SDRAM is integrated into the Adaptec RAID 5805 for maximum data integrity. PCI Express x8 Interface The Adaptec RAID 5805 features the PCI Express x8 interface which provides sufficient throughput and full-duplex operation for enhanced performance.